HPS series cone crusher integrated crushing speed, stroke and crushing chamber ideally, not only improving the capacity and quality, but also expanding the range of applications, from limestone to iron ore, roadbed stone to manufactured sand and small mobile crushing station. HPS series cone crusher shows the excellent crushing capacity in secondary crushing and fine crushing from rock with high hardness to conventional rock . HPS series cone crusher is the latest generation hydraulic cone crusher based on Shanghai Shunky several years and several generations product experience on R&D, especially CS series cone crusher whose technology is reliable demonstrated by testing, integrating the advanced technology at home and aboard. HPS series cone crusher is smarter and more humanized in structure, operation and maintenance, etc. 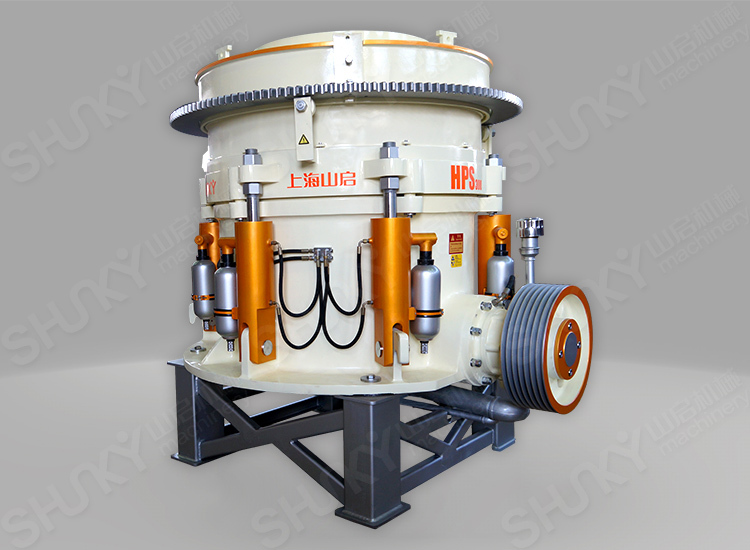 The whole working process of HPS multi-cylinder hydraulic cone crusher is that motor drives the rotation of transmission shaft by belt pulley and v-belts, then transmission shaft drives the rotation of eccentric sleeve around the main shaft through the spiral bevel gear, breaking the materials continuously.The material is crushed from all directions, crushed and ground according to their own grain, which formed the high compressive strength building aggregates. The materials that meet the requirements discharged from the crushing wall, and the remaining material continues to be crushed until it becomes standard product. 1. Upgraded structure and high efficiency. Transmission parts and the structure of lubrication seal are optimized based on the structure of fixed main shaft and eccentric shaft rotates around main shaft. With the features of stronger loading capacity, this machine has the biggest installed power, smaller size, higher efficiency and lower noise in the same model of this industry. 2.Laminated crushing brings good product shape. The materials are crushed by unique laminated crushing principle, and the efficiency is higher because of the optimized crushing cavity. Meanwhile high crushing efficiency brings lower consumption of vulnerable part, cubic finished product shape, and high content fine-grained product. In this situation, it improves the quality of finished product and decreases the cost of equipment and whole system. The lining plate adopts more advanced way for fixing and no need adhesive for installation and replacement, which saves time and cost. Thicker cone wall design is more reliable and has longer working life. 4. Hydraulic motor for adjusting the discharge opening. It can realize remote accurate adjustment, speedy dismount and continuously discharging opening by rotating hydraulic motor bidirectionally, which saves labor cost. The cylinder with hydraulic system provides overload and non-broken material protection when it is strained forward, on the contrary, clearing the cavity. It saves the time of maintenance and decreases the operation cost. The U & T sealing way and sphere floating seal prevent lubrication oil from being polluted by dust effectively, keeping cleanliness, protecting bearing, extending the service life of lubrication oil and main components. Integrated hydraulic lubricating design meets the needs of lubrication and hydraulic systems. It has compact structure, small volume, saving installation space, reducing fuel consumption. Bronze bushings and sliding bearing ensures high load capacity under excessive dust and high impact condition. The material cost is lower than the rolling bearing, and easily to replace by using conventional tools at the working site.